Place a few arugula leaves on every appetizer spoon. Sprinkle the steak lightly with olive oil. Season it with freshly ground black pepper and place a slice of beef on each appetizer spoon. 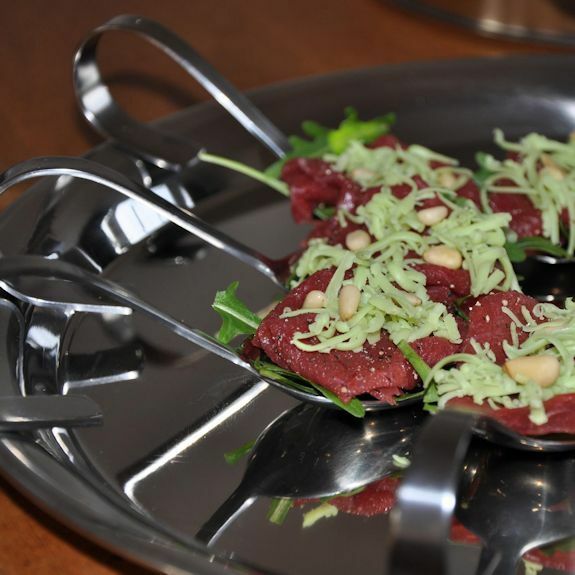 Roast the pine nuts in a dry skillet untill golden brown and grate the Landana Wasabi. Garnish the appetizer spoons with the pine nuts and grated Landana WASABI. Variation tip: you can also try it with Landana GREEN PESTO or Landana MUSTARD.